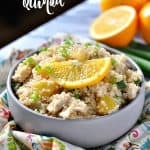 Delicious and easy orange sesame chicken quinoa, so healthy and something the whole family will love! 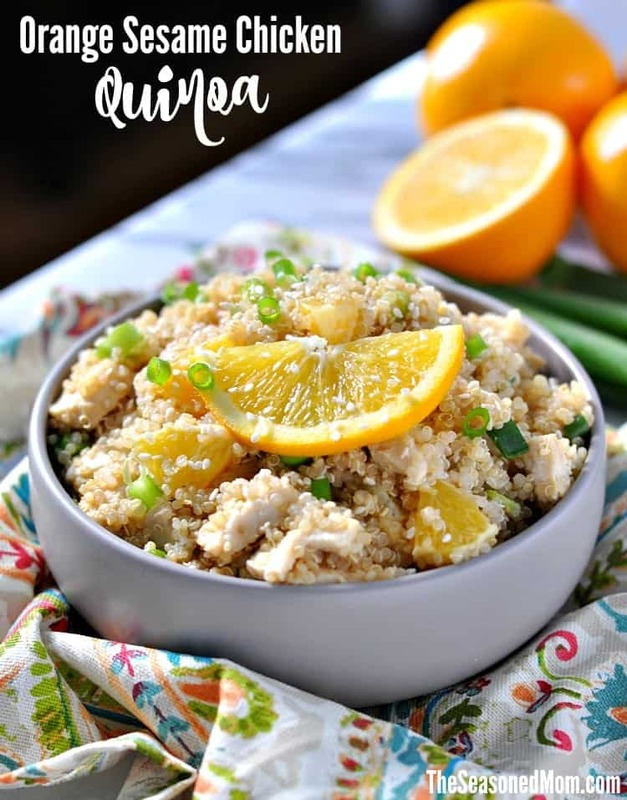 This simple and flavorful Orange Sesame Chicken Quinoa is a protein-packed healthy lunch or dinner option that comes together easily, can be made in advance, and is bursting with fresh citrus flavor! It’s a clean eating recipe that tastes delicious and will give you plenty of energy to stay fit and active this year! 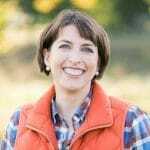 It’s no secret that I love to prepare seasonally-inspired dishes that highlight the fresh produce that’s available at any given time of year (hence, the name of my blog!). Since oranges (and citrus in general) are some of our favorite winter fruits, it’s probably not surprising that I’ve been using them in my cooking a lot recently. 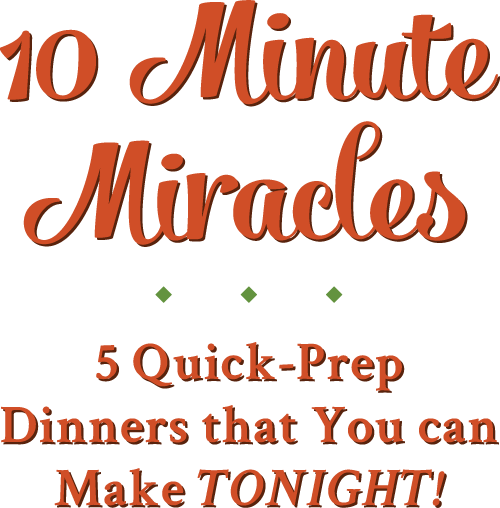 I love this particular dish because it’s easy to prepare (less than 30 minutes from start to finish, guys! ), and it can be made in advance. It’s great served warm right after you make it, but it’s equally good at room temp or chilled. The quinoa is fluffy yet satisfying — thanks to tons of protein from the quinoa itself, as well as the chicken and edamame that I toss into the mix. 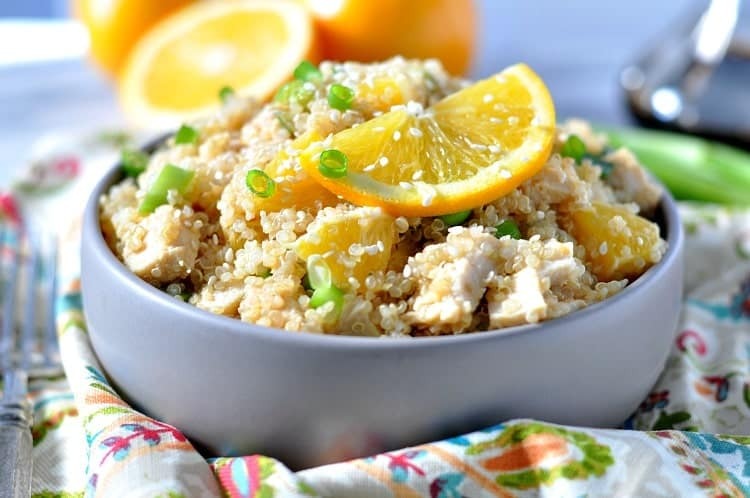 Freshly-squeezed orange juice, orange zest, and green onions keep it light and fresh, while the sesame and soy sauce add a great warmth and depth of flavor. Salty, sweet, and savory…all in one healthy dish! Enjoy this clean eating lunch or dinner option, friends! It’s a great way to stay on track this season and throughout the New Year! Rinse and drain the quinoa in a strainer. Cook quinoa according to package instructions. 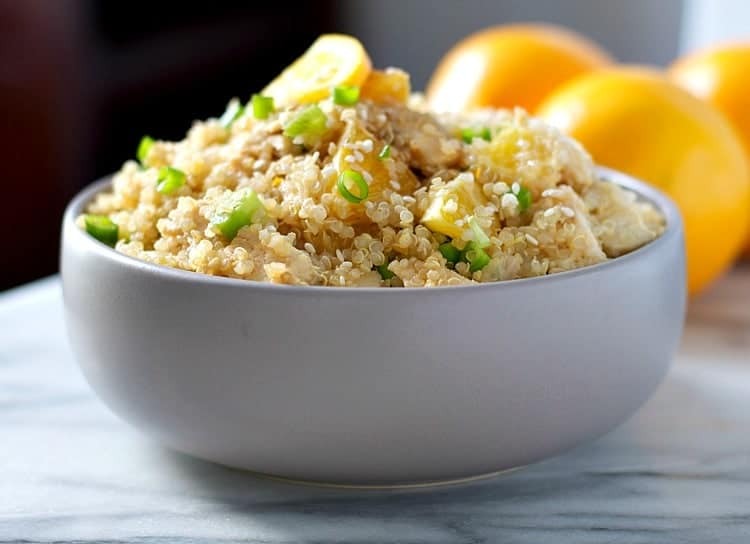 Place quinoa in a large bowl. 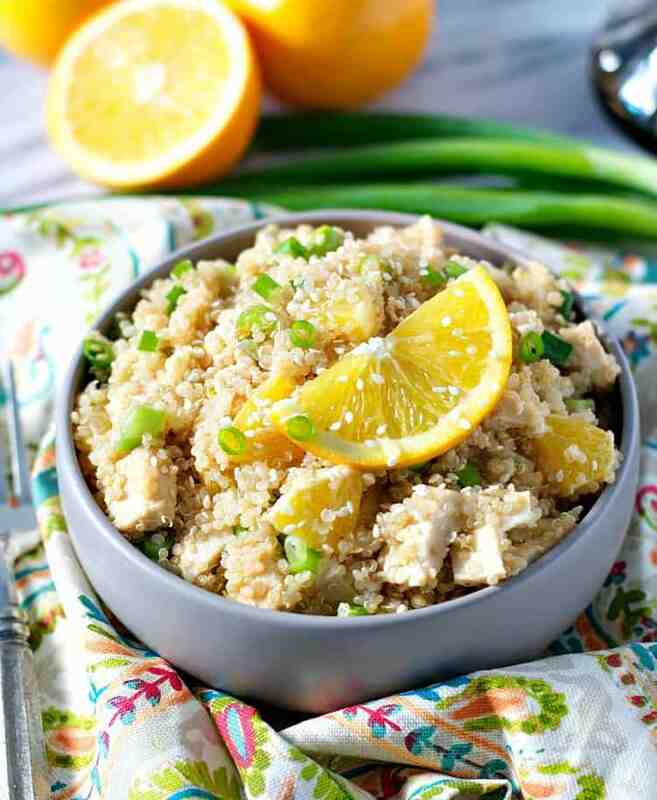 Stir in orange segments, chicken, edamame, and green onion. Prepare vinaigrette by placing orange juice, vinegar, soy sauce, sesame oil, and orange zest in a jar. Shake until completely combined. Dress quinoa mixture with the vinaigrette. Garnish with sesame seeds, if desired. Oh yum! This look amazing Blair. 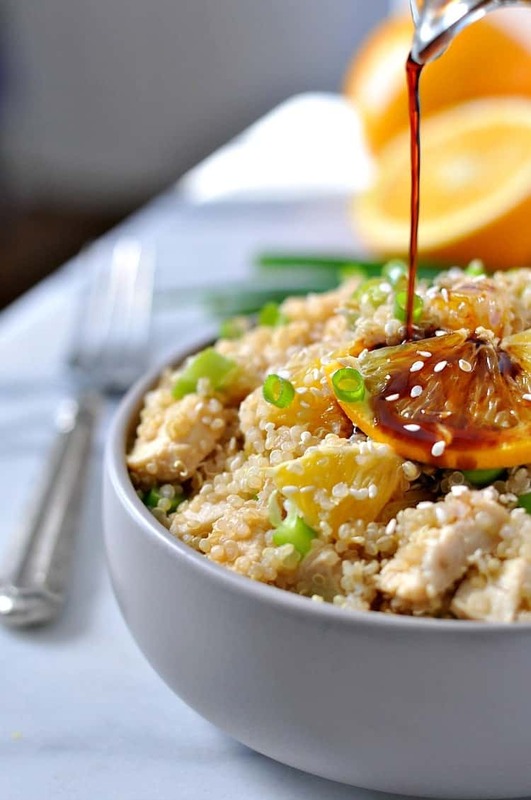 I have a skinny orange chicken recipe, but I haven’t donut with quinoa. I need to try this. Thanks so much, Megan! I need to check out your recipe for Orange Chicken. That flavor combination is so great — especially when oranges are in season (NOW)!! 🙂 Have a great weekend! Fabulous! The dish looks so delicious. 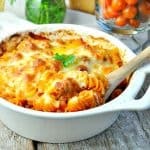 I have some days off at the weekend and cooking this dish might be my plans for the days. Thanks for the nice recipe. as well as provide terrific articles to blog owners. It’s a win win situation! If you are interested feel free to e-mail me at: [email protected] so we may communicate further. Hello! 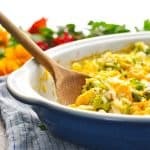 Could I use clementines in this recipe in replace of navel oranges? Thanks!! Oh that’s great! I have a whole bag at home already. Any suggestions of how many to use since their so much smaller? Thank you! I have just tried and its taste is really great! Hm! Looks so tasty! I will make one. Blair, I enjoy clementines so it was nice to you can use them in the recipe instead of oranges. For some reason, the clementines where I live seem to taste sweeter than the oranges (although I occasionally get a good orange). I have a question about Quinoa. I hear it’s excellent for you, but I’ve only heard about it for the last few years. Obviously, it’s always been around, but why did it take so long to make its way into mainstream recipes (or am I just out of the loop, LOL). Either way, this looks like a great way to put a spin on chicken and rice. Just another reason to buy a hotpot. 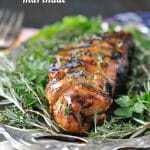 Cooking this recipe was love! My wife and kids really enjoyed it. I am glad you shared it. Thank you! Either way, this looks like a great way to put a spin on chicken and rice. Just another reason to buy a hotpot. 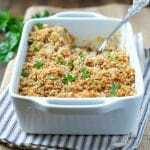 I tried the quinoa as if it were a pannzanella, onion cucumber tomatoes and a lot of basil, try it, and fast and delicious! Thanks for sharing this valuable information. But I haven’t do it with quinoa. I really need to try this. I will try this recipe for sure. My friends will love it much. I will be back with my reviews. Thanks. 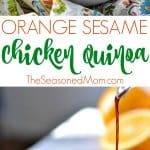 Sesame ITs sound amazing that orange with chicken Quinoa. And especially topping of orange pieces looks great. I had tried it by my self, and I am lovin’ it. Thanks, Blair for this lovely recipe. WOW, Amazing Will try for my Little can you please share your email with me ? I used normal onions instead of green onions and it turned out BEST! everyone loved it.Thanks for the recipe! !